Subscription services, most of them monthly, continue to proliferate, and it’s always exciting to receive one. I received a Graze box the other day, and my family couldn’t wait to dig in and try the interesting snack foods inside. 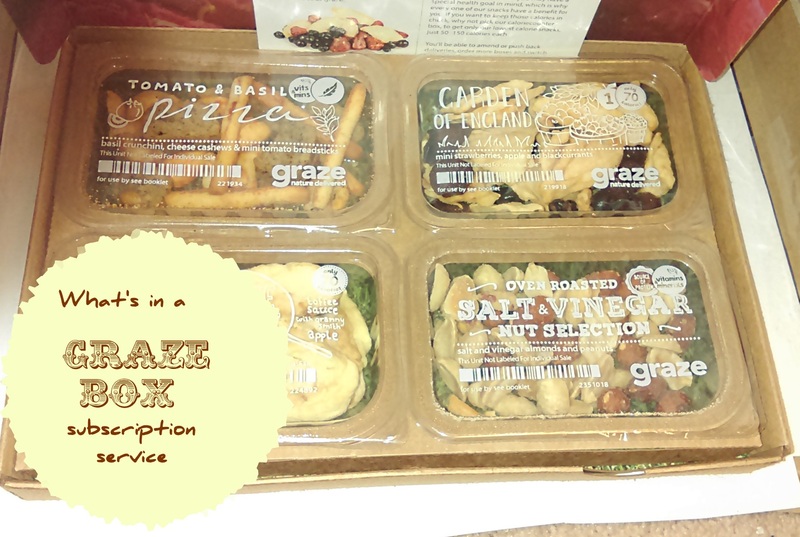 Graze offers deliveries every week or every other week of a regular box containing four “snack packs” for $6.49 or a “big box” (about 20 servings) with five sharing bags for $25. Delivery via USPS is included in the price. Graze gives you a selection of unique snack items, making it a great gift for a loved one who enjoys trying new things and has a taste for salty and sweet snacks. Graze’s low price points make it easy to buy a gift that fits any budget. Salt and Vinegar nut selection (almonds and peanuts), 1.3 ounces, 220 calories, 17 grams of fat, 200 mg of sodium, 5 grams of carbs and 9 grams of protein. I love salt and vinegar snacks and found these nuts delicious. Peanuts and tree nuts seem to make their way onto many popular diets, and these delightfully flavored ones make eating nuts a true pleasure. Garden of England mini strawberries, apples and black currants, .88 ounces, 0 fat grams, 5 mg of sodium, 19 grams of carbs and 70 calories. The dried fruit mix doesn’t contain a bunch of additives. The only ingredients are the fruits themselves and a little oil and lemon or apple juice as preservatives. Toffee apples, 92 ounces, 80 calories, 1.5 fat grams, 17 grams of carbs and 25 mg of sodium. My 10-year-old food taster loved these because of the toffee sauce, which tasted just like caramel to her, but thought the apples were a little tart. It was worth eating the apples as a caramel delivery device, though. Graze lets you “trash” certain ingredients in their dietary preferences section. However, the company cautions that its service isn’t suitable for people with food allergies, sensitivities or intolerances. You’ll want to keep this in mind if buying Graze as a gift. Want to try Graze for yourself? Use the code BETHM7NVE to receive your first box free!